Cathy Marie Buchanan’s The Day the Falls Stood Still, like the Niagara River and the falls, flows powerfully with majestic danger. 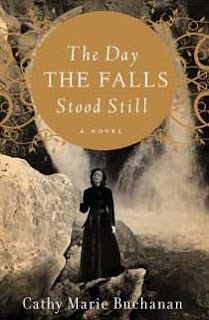 Elizabeth “Bess” Heath is a seventeen year-old woman on the brink of the falls contemplating the beauty of the river and feeling its power pushing her forward. Her family is well-positioned, but a turn of the current pushes them down river and leads to tragedy and redemption for Bess. When she leaves her school life behind at Loretto Academy, she is thrust into adulthood and embarks upon a journey where she comes into her own, earning the pluck Tom Cole, grandson of the famous riverman Fergus Cole, sees in her during their brief encounters at the gates of Glenview. Buchanan prose is calm, providing readers with an anchor amidst the rapids and whirlpools that threaten to toss Bess out on the streets and into the ditches emotionally and financially. Tom becomes her rock to which she anchors herself, and he provides her with focus, love, desire, and strength, just as the river does for him. However, with the outbreak of WWI and troops sent abroad to fight from Canada at the behest of Great Britain and the rise of hydroelectric power, Bess must find the strength on her own to survive without Tom’s guidance and to care for their budding family. As much as The Day the Falls Stood Still is about the impact of industrialization on the Niagara River, the falls, and the community, it also touches upon the environmental impacts of development, the loss of family, the dangers of progress, and the commitment of a man and wife to their family and their principles. Buchanan has created an emotionally charged novel based upon a real legendary riverman, William “Red” Hill. Complete with mock newspaper articles and historical photos and drawings depicting a variety of major events along the river from Bellini tightrope walking across the falls to the collapse of Table Rock. Buchanan’s debut novel is undeniably memorable for its historical references and emotional ties to Bess’ family and the Niagara River. The Day the Falls Stood Still will haunt readers after the final page is turned.